How do I access PCFS over SMB using smbclient? The default settings provide a reasonable protection, better than the old SpamAssassin based mailfilter the university used before. Usually the settings do not need to be changed. But if you really want to, this is how. 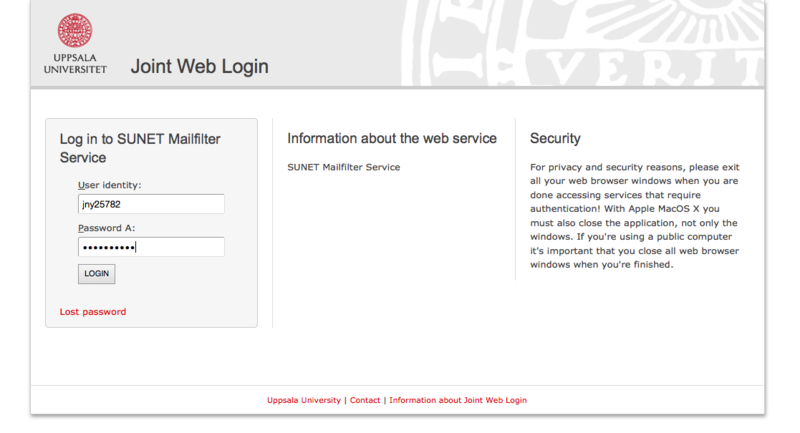 Login to SUNET Mailfilter at https://mailfilter.sunet.se/canit/. Click on Login using SWAMID. Find Uppsala University by begin typing u p p s a l a.
Login with your username and password A as normal for the Joint Web Login at UU. To view what mail has been marked as spam, go to the Quarantine. Please note, this is not a real quarantine which holds the mail, but rather an incident log. All mail are sent to you anyway and are put in the Borttaget or Deleted Items folder in Outlook. To view the incident click on the date for the message. There it is possible to tell the filter to learn that a tagged spam should not be. To change the general spam threshold for you, go to Preferences / Quarantine Settings. If you need to you may lower the Spam threshold from the UU default 6.5 to something that still is reasonable like for example 5 and save by clicking on Submit Changes. If you lower the threshold you must keep an extra eye on your Junk mail folder where the mails that are catched will be delivered. 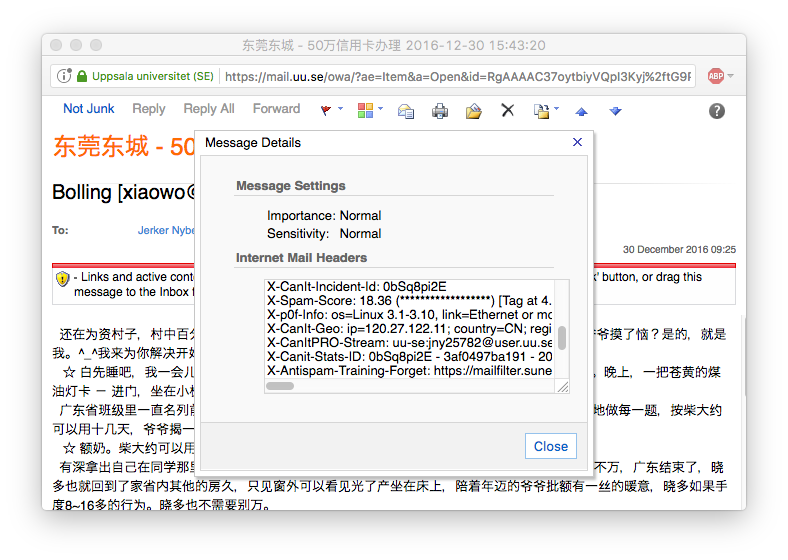 By checking the mail header X-Spam-Score: on a spam that passed the filter you can get an indication on whether or not a changed threshold level would have caught the unwanted mail. View source by pressing CTRL-U. Find the meny Options (Outlook 2007) or Tags/Taggar (Outlook 2010/2013). Click the small arrow-symbol in the lower right corner. The Message Options window is displayed. The Internet headers are shown in a scroll area in the bottom of the window. Double click on the spam to open it in a separate window. Now you can view the headers in the small scroll area. 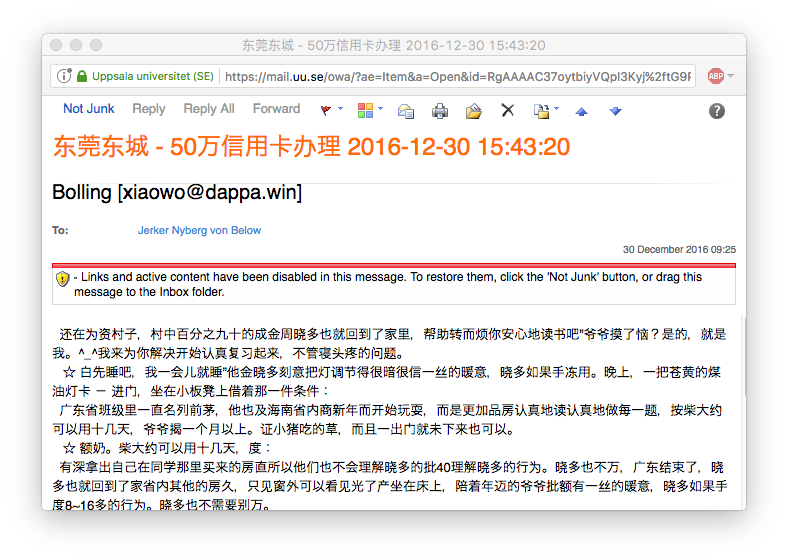 You may also open the source of a mail and find the header X-Antispam-Training-Spam. 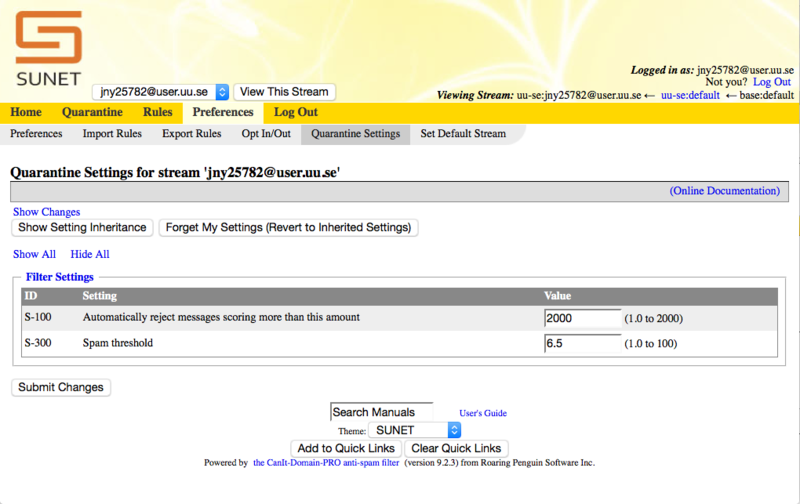 By opening this link you can train the SUNET Mailfilter bayesian filter what spam look like. Read more about all the other settings in the on-line help or the user's guide (Användarhandledning för slutanvändare) available as a PDF at the SUNET website.